Proximal renal tubular acidosis is a disease that occurs when the kidneys don't properly remove acids from the blood into the urine. As a result, too much acid remains in the blood (called acidosis). When the body performs its normal functions, it produces acid. If this acid is not removed or neutralized, the blood will become too acidic. This can lead to electrolyte imbalances in the blood. It can also cause problems with normal function of some cells. 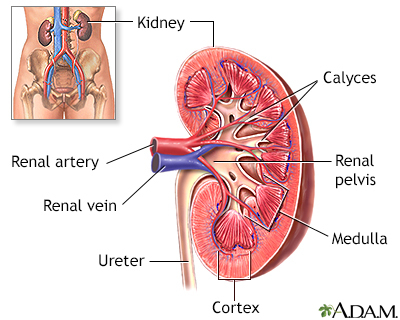 The kidneys help control the body's acid level by removing acid from the blood and excreting it into the urine. Acidic substances in the body are neutralized by alkaline substances, mainly bicarbonate. Proximal renal tubular acidosis (type II RTA) occurs when bicarbonate is not properly reabsorbed by the kidney's filtering system. Type II RTA is less common than type I RTA. Type I is also called distal renal tubular acidosis. Type II most often occurs during infancy and may go away by itself. Hyperparathyroidism is a disorder in which the parathyroid glands in your neck produce too much parathyroid hormone (PTH). Fatigue is a feeling of weariness, tiredness, or lack of energy. Hyperventilation is rapid and deep breathing. It is also called overbreathing, and it may leave you feeling breathless. Weakness is reduced strength in one or more muscles. The pulse is the number of heartbeats per minute. The health care provider will perform a physical exam and ask about the symptoms. A urine pH test measures the level of acid in urine. The goal is to restore normal acid level and electrolyte balance in the body. This will help correct bone disorders and reduce the risk of osteomalacia and osteopenia in adults. Some adults may need no treatment. All children need alkaline medicine such as potassium citrate and sodium bicarbonate. This is medicine that helps correct the acidic condition of the body. The medicine helps prevent bone disease caused by too much acid, such as rickets, and to allow normal growth. Thiazide diuretics are also frequently used to preserve bicarbonate in the body. The underlying cause of proximal renal tubular necrosis should be corrected if it can be found. Vitamin D and calcium supplements may be needed to help reduce skeletal deformities resulting from osteomalacia. Vitamin D is a fat-soluble vitamin. Fat-soluble vitamins are stored in the body's fatty tissue. Although the underlying cause of proximal renal tubular acidosis may go away by itself, the effects and complications can be permanent or life threatening. Treatment is usually successful. Call your provider if you have symptoms of proximal renal tubular acidosis. Most of the disorders that cause proximal renal tubular acidosis are not preventable. Bose A, Monk RD, Bushinsky DA. Kidney stones. In: Melmed S, Polonsky KS, Larsen PR, Kronenberg HM, eds. Williams Textbook of Endocrinology. 13th ed. Philadelphia, PA: Elsevier; 2016:chap 30. Seifter J L. Acid-base disorders. In: Goldman L, Schafer AI, eds. Goldman-Cecil Medicine. 25th ed. Philadelphia, PA: Elsevier Saunders; 2016:chap 118. Sreedharan R, Avner ED. Renal tubular acidosis. In: Kliegman RM, Stanton BF, St. Geme JW, Schor NF, eds. Nelson Textbook of Pediatrics. 20th ed. Philadelphia, PA: Elsevier; 2016:chap 529. The kidneys are responsible for removing wastes from the body, regulating electrolyte balance and blood pressure, and the stimulation of red blood cell production. 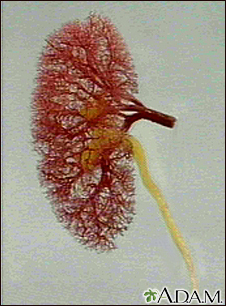 This is the typical appearance of the blood vessels (vasculature) and urine flow pattern in the kidney. The blood vessels are shown in red and the urine flow pattern in yellow. Reviewed By: Walead Latif, MD, nephrologist and Clinical Associate Professor, Rutgers Medical School, Newark, NJ. Review provided by VeriMed Healthcare Network. Also reviewed by David Zieve, MD, MHA, Medical Director, Brenda Conaway, Editorial Director, and the A.D.A.M. Editorial team.